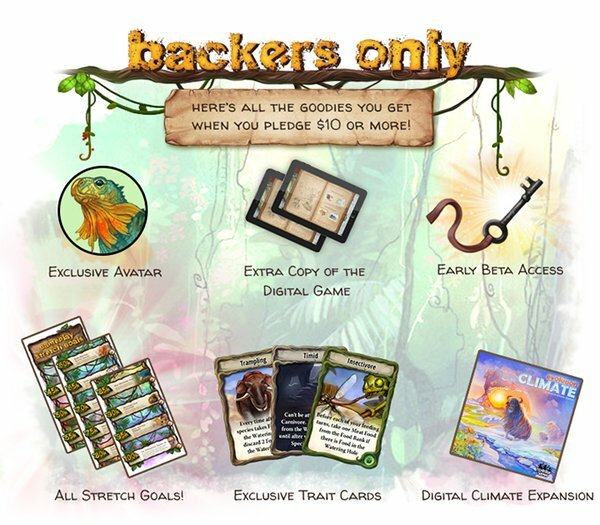 North Star Games’ Kickstarter campaign for Evolution – The Video Game has obliterated its $40k funding goal, with nearly $103,000 in pledges and over 3,800 backers! At the time of this posting there is only about 34 hours left in the campaign, so if you are at all interested in this amazing digital board game adaptation, then I HIGHLY recommend backing this campaign (I myself am a backer). For as little as $10, you can get in on either the iOS or Android beta (and get a released copy next year). More than $30 worth of free exclusive extras which have been unlocked during the campaign! More than $30 of Kickstarter-exclusive stretch goals have been unlocked, in addition to many pledge-level exclusives. This is the best deal we’ll ever offer for Evolution: The Video Game. We’re serious that we need you playing this game to help us make this the best digital board game ever. Special Watering Hole Challenges that introduce new goals. *Additional copy is final release only, it doesn’t include beta access for this platform. There are still some final last minute stretch goals to be unlocked including asynchronous gameplay, in-game chat, game-soundtrack downloads, and Evolution-themed wallpaper. Check out the campaign and help unlock the final goals. The streams are a great way to learn some strategy and see how the game plays.